Above: Stanley Fine and Caroline Hecker, representing Royal Farms, address the Baltimore Board of Municipal and Zoning Appeals. Opponents of a 24-hour, 12-pump Royal Farms gas station and convenience store proposed for Hamilton will get another chance to make their case against the project in a public forum. 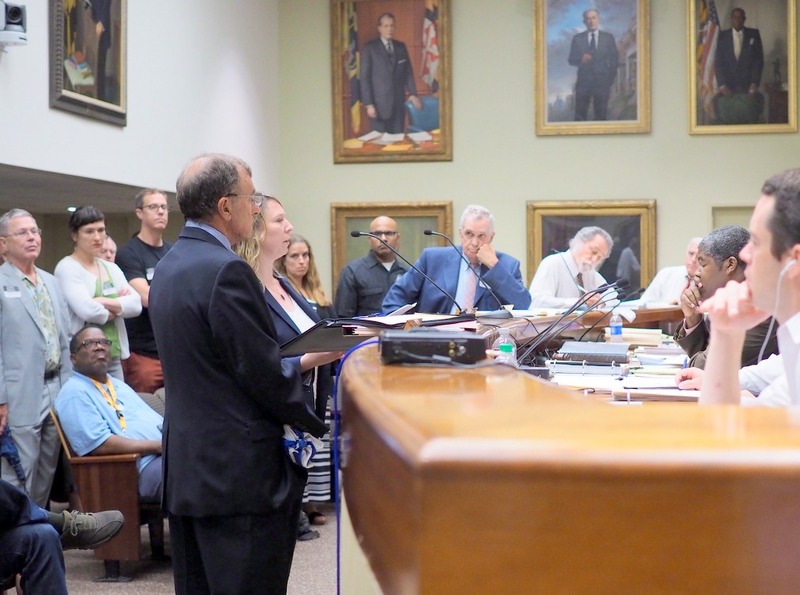 For approximately an hour yesterday, members of Baltimore’s Board of Municipal and Zoning Appeals heard arguments from attorneys for and against the project, but they took no testimony from the general public and took no official action. Instead, they set September 22 as the date on which they will hold a new public hearing to determine whether to approve a request from Royal Farms, trading as Two Farms Inc., to build a gas station and convenience store at 5901-21 Harford Road. Roop Vijayan, vice president of the Glenham-Belhar association and an organizer of a protest group called No RoFo Hamilton, said he was pleased with the zoning board’s action on Tuesday. Going back to 2012, the project has drawn strong opposition from the Glenham-Belhar Community Association and several other neighborhoods in northeast Baltimore, including Lauraville, Hamilton Hills, Waltherson and Westfield. Opponents say they believe the development is too big, is inappropriate for the area, would add to traffic problems in the area and would depress property values. They also have expressed concerns about underground tanks leaking fuel into the ground and contaminating neighboring properties. But residents who had come to City Hall on Tuesday hoping to again inveigh against the project never got the chance. More than two dozen community members had come to the zoning board’s weekly meeting, which had the Harford Road project on its docket. Many signed up to testify against it. But none of the residents were called up to speak. Zoning board chairman Geoffrey Washington explained that Tuesday’s meeting was a preliminary hearing to address procedural matters and determine how the board should move forward with the case, which the panel first heard on April 2, 2013. 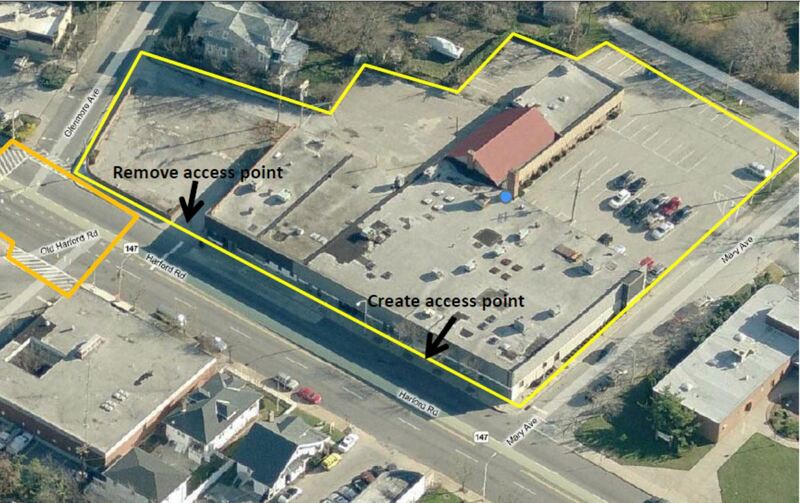 The zoning board initially approved the project subject to conditions outlined in a resolution that was later reworded following a phone call to the zoning board office from Royal Farms’ attorney Caroline Hecker. Royal Farms’ plan calls for a 4,100-square-foot convenience store in addition to a 12-pump gas station that would be open 24 hours. The store by itself can be built without approval from the zoning board, but the gas station cannot. At Tuesday’s meeting, Hecker said she did not believe there was any need for the board to hear additional testimony from the community because members heard testimony in 2013 and the basic facts of the case have not changed. She noted that Royal Farms agreed to reduce the size of the convenience store and the number of fuel dispensers and parking spaces in its original plan. But John Murphy, the attorney representing opponents of the project, said the Court of Special Appeals had ordered that the zoning board conduct “a new hearing,” not simply restate its previous decision in a public session, and his clients wanted a chance to speak at the new hearing. He warned that the board could be accused of denying the community “due process” if it didn’t hold a full hearing and take testimony from residents. 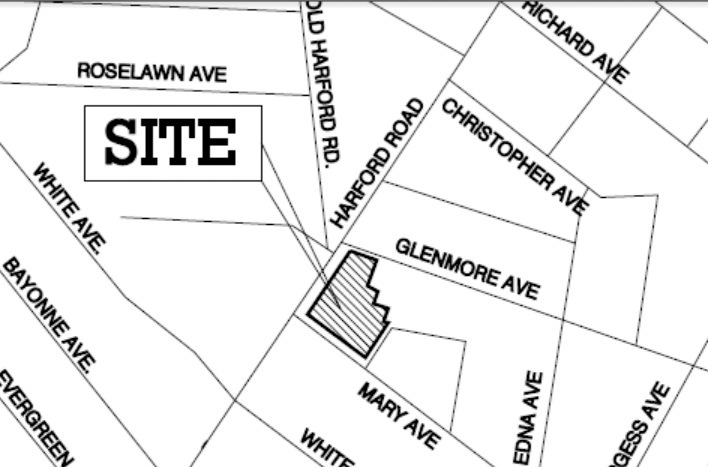 Site of proposed Royal Farms store at corner of Harford Road and Glenmore Avenue. Much of the dispute involved the conditions set by the zoning board in its 2013 resolution. 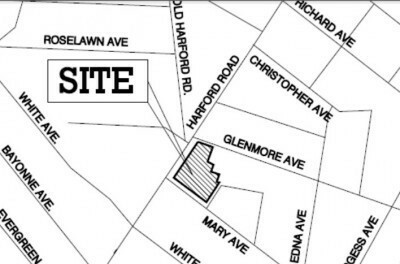 Initially, the board had said it would approve the project under the condition that Royal Farms donate land so that the city could realign the intersection of Harford Road and Glenmore Avenue to make it safer for pedestrians and vehicular traffic. But the board staff re-worded the resolution, after Hecker’s phone call, so that it specified only that the land would be donated to the city – not that the city would complete the realignment. 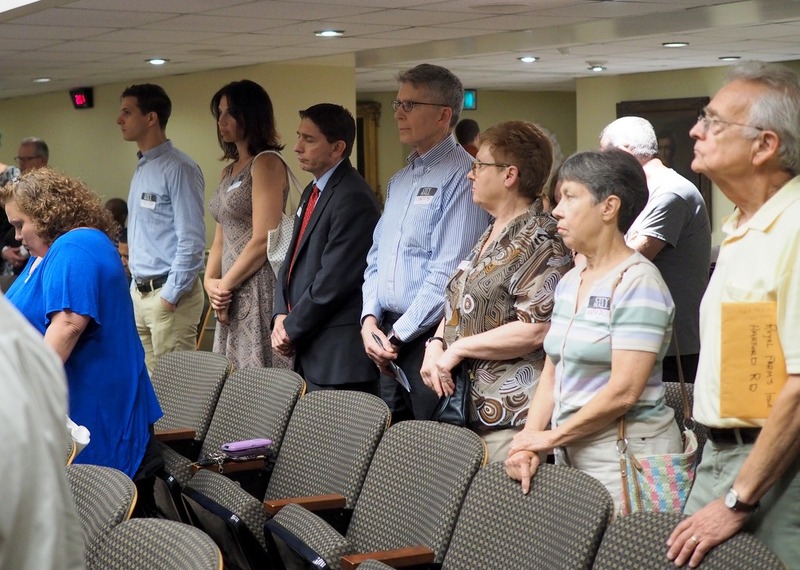 The community appealed the board’s action in part because the changes were not made during a public session. On Tuesday, Murphy indicated that his clients have concerns about the city’s ability to move ahead with realignment of the intersection even if Royal Farms donates the necessary land because more than two years have gone by since the zoning board took its last action and the city is in a different budgetary period. Neighborhood concerns were fueled by a recent community meeting with Mayor Stephanie Rawlings-Blake, who was asked about her position on the gas station. The mayor said she “can look into it,” adding that she thought the matter was in the court system. Her noncommittal response was a sign to some community leaders that their protests either had not been heard by the Mayor’s Office or were not being taken seriously. The city councilman for the area, Robert Curran, has supported Royal Farms, even though the communities he represents do not. 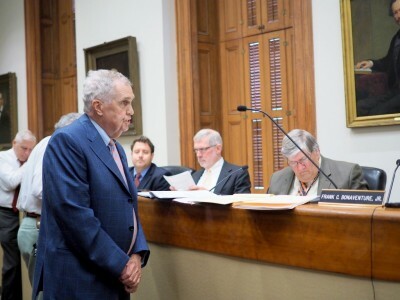 In deliberations after the attorneys made their arguments, zoning board member Martin King noted that the five-member zoning board has two members who weren’t on the panel when it first heard the Royal Farms case — himself and Michael Barb. King said he thought the newer members would benefit by having a new hearing with public testimony. During their deliberations, zoning board members indicated that they may limit testimony to a certain amount of time, such as up to one hour for each side to present facts and evidence, and up to one half hour for each side to present arguments and rebuttals. They said any time limits would be determined after consultation with the attorneys for both sides. Within that predetermined time frame, board members said, the attorneys and their clients will be free to present any evidence and arguments they want. The board set July 30 as the deadline to accept “pre-submissions” of facts and information about the case and August 20 as the deadline for responses to those submissions. The September 22 hearing will be held in Room 215 of City Hall, 100 North Holliday Street.